Mix the 6 tablespoons of cooking oil with maida and mix them so that it is in the form of breadcrumbs. Now add water and make into soft dough and cover it with a damp cloth. Fry the khoya till it is of light brown shade. Add the sugar, kismis and almonds and mix well with it. Fry for some time and allow it to cool. Now roll the kneaded dough into chappathi shapes but a little thicker and a little smaller in size. Fill half of the round with the khoya mixture and seal it tightly with the other half, twisting the edges inwards. Care should be taken that the filling does not ooze out of the gujia. If the gujias are to be stored for long, then they can be dropped into hot sugar syrup. The above measures would make around 40 medium-sized gujias. Mix the besan, salt, chilli powder and mustard oil well. Add water and knead into dough. Mix the methi leaves and knead for another 3 minutes. Heat the cooking medium to high heat. With some oil in hand roll the dough into a long roll of 1inch thickness and cut it into 1-inch pieces. Flatten each piece into a round shape and roll it into 6 inch chapattis, but it should be thinner than normal chapattis. Now fry it lightly at medium flame to a yellowish shade. Soak the rice, badam and kaju. Put the saffron in the 7 glasses of water and boil. Put the soaked rice in the boiling water and also some lavang and elaichi pieces. When the rice is done sieve it to drain excess water. In a heavy bottomed pan put some ghee and add some more elaichi and lavang and fry for 2 minutes. In a pressure cooker put half of the cooked rice and then half of the sugar and then the remaining rice. Cook over a low flame. Add the remaining ghee to the rice, occasionally stirring it. Cook for 25 minutes. Now add all the dry fruits and the mixture should be well steamed. Add 3 teaspoons of kewra and cover the vessel. After the water has dried up add the khoya and cook for 15 minutes and take the vessel off the fire and put a silver foil over it. Totally it would take around 45 minutes to 1 hour for this preparation. In a vessel take some water enough to cook the rice. Put it over the fire. Now add the rice, ghee and milk to it. The boiling over of the liquid and the rice symbolizes the overflowing prosperity. When cooked add the powdered jaggery and the crushed cardamom and cook till the water dries up. One tablespoon-grated coconut can be added. Serve hot or chilled as desired. When 3/4 cooked, add the salt, jeera and pepper. Roast the sesame seeds in a tawa and pound it in a mortar to remove the outer shell and release the aroma. Slice the jaggery into small chips and add the sesame seeds to it. Heat a tawa and spread the rice batter on it to the size of a small puri with a small ladle. Lightly heat it and remove from fire and make sure the jaggery does not melt and flow out. The pitha should be white and should not be made to turn brown. Store it in an airtight container and it will keep for one week at room temperature. Lightly roast the sesame seeds. Heat the jaggery in a pan till it melts and then add the roasted sesame seeds to it. Once the jaggery starts to firm up, remove from fire. Lightly grease your palm with some ghee and roll one tablespoon of the mixture into a ball. Serve when the balls come to room temperature. Grate the coconuts and pour the grated coconut and sugar into a saucepan. Stir well over medium heat. 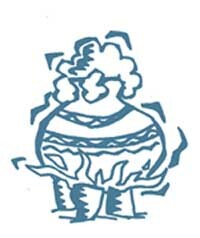 Once the water from the coconut begins to from lumps, remove the mixture from fire. While still hot grease your palms with a little ghee and roll the mixture into small laddoo balls. The mixture should not be allowed to get cool, as it would not aid in the formation of the laddoos. Take fresh cottage cheese. Put the ghee in a kadai and add powdered sugar and the cheese and the shelled elaichi. Saute well but do not allow it to turn brown. Turnnoff the heat and add some more powdered sugar which is of binding consistency. Make into small balls of desired size and allow it to cool and serve. Clean the beej seeds and allow them to dry. Saute them in a pan till they turn brown. Add the finely ground sugar or the boora which is a sweet binding for the seeds. 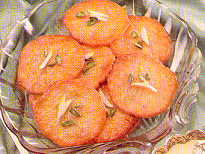 Break the makhanas into two or three pieces and saute them in a frying pan on medium heat. Saute for 3 to 4 minutes but do not allow it to turn brown. Add ground sugar with the makhanas and then water. Sugar forms a light coating over the makhanas. Makhanas should not stick together but should remain white and round. Total cooking time is 5 to 6 minutes. Take a cooking medium in a frying pan and add the coconut gratings and saute for 3 to 4 minutes. Do not let the gari become brown or mushy. It should remain loose even after adding the powdered sugar Now add the water, which will bind the gari. Cook for 2 more minutes. Cooking time is 5 to 6 minutes. After cleaning the charonji put it inside a frying pan with the cooking medium inside and saute it for 3 to 4 minutes. The brick color of the charonji should be maintained but it should not be raw inside. Then add sugar and the water and mix thoroughly. The sticky syrup will bind the charonji well. The mixture can be served with dry fruits. Time taken for cooking this item is around 5 minutes. Get some white Gond crystals and not the brown ones. This paag is found to cure backaches and hence it is given to women after delivery. First the cooking medium is heated and the Gond crystals are put in. The crystals should be more or less deep-fried. Make sure that both the sides are evenly puffed. Water should not be added and the sugar should be added after the pan is taken off the fire. Sprinkle the sugar. Serve with the other paggi meva. Add all the other ingredients leaving the tulsi, makhanas and the gari. Finally add the remaining items and keep it in the refrigerator. At the time of puja serve in small cups with a little curd. Place a frying pan in fire and saute the rava till it turns brown adding the ghee. Then add the sugar when the rava turns white again. Take the pan out of fire and add the beej, makhanas and gari. It should be decorated on top of the kasaar. Mix the meva well while serving. Mix the makhanas with the milk and cook for about half an hour. Once the makhanas are cooked add sugar and take it off the fire. Add the coconut and almonds. This kheer will he more watery and it should be refrigerated before use. Fry the potatoes and pumpkin with a little haldi and salt. Put 2 tablespoons of cooking oil, tejpatta, the seeds and red chilli. Simmer still soft. Sprinkle powdered masala after taking off from fire. Wash and strain the rice and the dal. Fry for some time and then add the dal and rice and continue the frying. Put the ginger and enough water for cooking the rice and dal but the bhunee khichari should be dry finally. Cover and simmer. Add some sugar and salt according to the taste desired and also some green chilies. Remove from fire and sprinkle dalchini powder and serve with a final dash of ghee or butter. Boil the water along with the oil and then take it off. Add the flour and knead it well. Mix the coconut gratings, dry fruits and sugar. Stir them on fire. Add milk and khoya and cook till well done. Make small holes in the dough and place small amount of the filling inside it and seal it well. Shape it like garlic and steam it for 10 minutes. Soak the rice for half an hour and then drain it. Add the sugar and cook for another 5 minutes. Take it off and add the kewra essence. Mix the maida, ghee and sugar with warm water. Also mix ground cloves, cardamom, raisins, cashews and coconut. Mix till a binding consistency is achieved. Then take small quantities of the mixture and shape them like small pancakes. Fry them in ghee and keep them in airtight containers when cool. Warm the water and add sugar to it. Sieve the maida and suji and mix well. Mix the sugar syrup to this mixture slowly and knead it well. Then deep-fry them in ghee at medium fire. The mandhi should be dark brown in color. The above measurements would yield around 14 Mandhis. Mix the sugar and milk well and when the sugar is dissolved add the flour and form a batter. Beat the batter till smooth and add the rest of the ingredients. Fry till golden brown and drain the excess ghee. Put sugar, a little water and honey in slow fire. With ghee fry the vermicelli till golden color. Add the prepared syrup, cardamom and the nutmeg. Mix well and cook on slow fire till it is dry. The final product should be separate and not sticking together. Serve garnished with the almonds, khoya and raisins. Trim the bread slices and cut them into four pieces and deep fry to golden color. Fry all the nuts and pound coarsely. Cook the milk, condensed milk, 2 tablespoons sugar, cardamom and nutmeg on low flame. When the mixture thickens put the fried bread slices side by side in the pan. Serve cold garnished with nuts, raisins and silver foil. Heat the sugar in a pan till it melts and becomes brown and then add the water to make caramel syrup. Melt the butter and then add the condensed milk. Mix the maida with the condensed milk mixture and the soda. Then add the caramel syrup and the chopped dry fruits and mix well all these. Grease a cake tin with butter and pour this mixture into the tin and bake for 45 minutes at 150 degrees in an oven pre-heated to 150 degrees. Beat the butter and sugar until it is light and creamy. To this add the maida, cocoa and baking powder slowly while mixing well. Then add the condensed milk and the milk and mix well adding them alternately. Pour this mixture into a greased tray which is dusted with maida powder. Then bake this at 160 degrees for 30 minutes at a pre-heated oven until the center becomes spongy. Melt the butter and add the cocoa powder and cook over low heat for 1 minute. Remove from heat and add the condensed milk and mix thoroughly. Spread this over the cake and allow it to set.